Road rage continues to be an epidemic among roadways in the United States. We have all seen the shocking videos online: drivers fighting other drivers for seemingly incidental and arbitrary reasons. While you may think that this won’t happen to you, it likely could happen and may end tragically if you do not know what to do. Obviously the golden rule is not to engage in road rage, but sometimes an aggressive driver has it out for you. If you are confronted with such an aggressive driver, there are vital steps you should take which can deescalate the situation. First, try to diffuse the situation before it begins. If a driver honks or flips you off for a perceived aggression you made, you can show remorse. This is often the most successful way of diffusing a potentially dangerous situation. You can do this by mouthing “Sorry!” or wave to them. Allow drivers ample space to pass you. If this does not work, you can report the driver to the authorities if you or others on the road are in imminent danger. Do not play vigilante. Specifically, do not chase down the driver, or engage in retaliatory road rage by cutting them off, running them off the road, or making obscene gestures. Instead, pull over to a safe location that is out of the way of traffic. Finally, if you are in a situation in which an aggressive driver has exited his or her vehicle, call 911 immediately. Do not exit your vehicle and make sure your doors are locked. Do not make eye contact with the aggressive driver, and do not communicate with the aggressive driver. Instead, look ahead. If you can safety drive away, do so. Otherwise, wait for the authorities to arrive and diffuse the situation. Road rage leads to incredibly unsafe conditions for all drivers. Before you are confronted with a situation of road rage, make sure your seat belts are in working order. If your seat belts are faulty or locked, a seat belt repair service is necessary. The experts at Safety Restore can assist you with seat belt repair. Specifically, Safety Restore can assist with seat belt buckle repair, seat belt retractor repair, seat belt tensioner repair, and seat belt webbing repair. 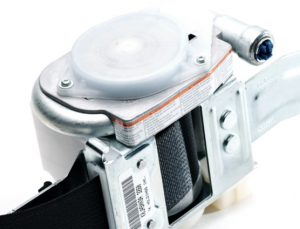 Using only OEM products, your seat belt repair will meet or exceed federal guidelines and regulations. Seat belt repair is especially vital for cars that were involved in accidents or purchased from an auction in which the seat belts have locked. Seat belts are one of the best preventative measures you can take before an accident. Do not prolong the inevitable – let Safety Restore assist with your seat belt repair today. Previous Previous post: What is an airbag module reset and why do I need it?